Gilbane Building Company celebrated a major milestone today on the West Haven High School project in West Haven, Connecticut. The topping off ceremony for phase one of this long-anticipated high school renovation was attended by City officials, Superintendent Neil Cavallaro and other school administration, the West Haven School Building Committee, as well as project team members from Gilbane Building Company, project Architect Antinozzi Associates and the Capitol Region Education Council. West Haven High School is being renovated over three phases, so it can remain in operation for the duration of construction. The first phase includes construction of a cafeteria, full-service kitchen, culinary arts, building services, tech-ed shops, media center, auditorium, music and arts classrooms and administrative offices. The second phase includes the new gymnasium and locker rooms, new science classrooms addition and the renovation of the three-story building after demolishing the existing cafeteria and media center. The third phase includes demolishing the existing auditorium and music spaces, renovating the northern wing of academic spaces and demolishing the existing gym and southern academic building. Construction commenced in July 2017, which included enabling work. The project is expected to complete in the spring of 2022. A builder in Connecticut since 1944, Gilbane has grown to become one of the largest providers of construction management services in Connecticut. With offices in Glastonbury and Stamford, Gilbane has remained a leader in the delivery of comprehensive pre-construction services, construction services and construction administration. 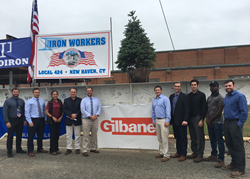 In 2014 Gilbane was named Contractor of the Year by Engineering News Record (ENR) for the Tri-State Area (NY, NJ, CT) and the #3 Top Construction Firm in the State of Connecticut in 2013 according to Book of Lists CT. Gilbane is ranked one of the top three best construction firms in the State of CT by the Connecticut Subcontractors Association.